During the Golden Age of Piracy, several pirates roamed the waters off the Outer Banks of North Carolina. Captain Kidd, Calico Jack, Black Bellamy and the famous Blackbeard all created an unforgettable reign of terror for the coastal colonies. Pirates had their own identifying flags, and when waging battle, they would hoist the Jolly Roger - the infamous skull and crossbones flag. Blackbeard gained a notorious reputation that often led his victims to surrender without a fight. 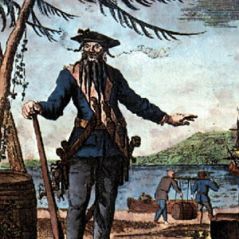 Blackbeard dressed in all black and would tie colored ribbons in his long black beard. He lit slowly burning cannon fuses and then placed them under his beard. Blackbeard was tall with a muscular build, and with smoke billowing around his head, was terrifying enough to strike fear into the hearts of the bravest of men. His defeat and beheading was the end of an era, but his legend lives on. Locals say that on clear nights, Blackbeard's body swims around Teach's Hole in Ocracoke in search of his lost head. The waters glimmer and shine in the moonlight, hence the name "Teach's Lights." It's said that whoever follows these lights to the end will find Blackbeard's buried treasure, but they will also find the devil himself sitting cross legged upon the chest, ready to claim himself as Blackbeard's sworn partner! Pirate Trivia - Did you know...? Pirates believed that having women on board the ship was bad luck, yet there were famous women pirates. Life on a pirate ship was dangerous, but not because of fighting! Many pirates died of food poisoning, starvation, and common diseases. Pirates often didn't get enough vitamin C, which sometimes led to blindness - this is why many wore eye patches! Pirates believed that piercing their ears with precious metals would give them better eyesight! Movies made the phrase "Walk the plank" famous. In reality, most people were just thrown overboard. Ghosts are all sorts of things to different people. Outer Banks folklore tells tales of spooked farm animals, creaking floors, squeaking doors, seeing things move out of the corner of one's eye and general uneasiness. Some people believe they are energy sources, some believe they are heavenly comforts. There is the Gray Man of Hatteras, who roams the beach between Cape Point and the lighthouse, who beckons residents to find safe ground when storms approach. There are stories of ghost ships, eerie cries and moans from the sunken Carroll Deering, known as the phantom schooner, and ghostly piano tunes said to be heard on quiet Outer Banks nights. On Roanoke Island it is said you can still see the spirit of Virginia Dare in the form of a white doe roaming the forests around Mother Vineyard. Are these legends simply good storytelling, or is there more to it? Looking out over the vast Atlantic Ocean at night makes one wonder just what is fact and what is fiction... You decide.